Here we are on New Year's Eve already! We're gearing up for an early celebration and some fun times this evening. How will you celebrate the new year? 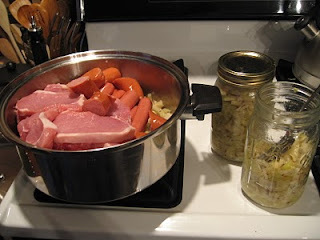 Here's the way I've been preparing our saurkraut since I married into this family! My husband's 98 year old grandmother shared her traditional recipe with me years ago. Thanks Grandma! We're starting with some homemade saurkraut that I made about 6 weeks ago. It should be nice and tangy by now. Quantities are based on how many you're feeding so just wing it! Add all the meat you plan to include..we use a few beef weiners, beef polsa keilbasa, and a little pork roast. Then add the rest of your saurkraut. Sounds pretty normal and straight forward so far right? Next, slice an onion on top. Then slice an apple on top. Next top with celery leaves. Simmer steadily on stove top over medium heat with lid for 2 hours. I love the flavor that the onion, apple and celery leaves give to the traditional saurkraut taste...and smell! This post is linked to Tuesday Twister hosted by GNOWFGLINS where you can read about what's cooking in other whole foods kitchens this week. This the first time I've participated in a blog carnival with MUSINGS OF A HOUSEWIFE but I thought it looked like fun so here goes... I think I'll go backwards just to review...since The Woodwife's Journal is only 6 months old, I'm posting the first line from the first and the last post of each month. Sprinkled in among a few rather mundane topics are a some herbal remedies, homemade personal care products, more whole food recipes and a few other tidbits that I think you might enjoy. It's been 6 months of fun learning about blogging and connecting with new folks who share some great ideas. Hope you have a Blessed New Year! DECEMBER - A Success Story - After taking a nasty fall on the ice and jamming his spine, my husband has been off work for the past week. Thanks Again For All You've Done! - A while back, I posted a big THANK YOU! to everyone who has inspired me to learn more over the past several years. And in the middle we had Pumpkinpalooza! and Wild Cranberries. Harvesting Venison - From the time I was 12 years old, I've been a hunter. OCTOBER - More Aromas - Since the early morning temp here in rural PA was 39°F yesterday with threats of the first frost of autumn, I harvested some of my herbs to dry for winter teas. Apple Chili - Here's a new Applemania! 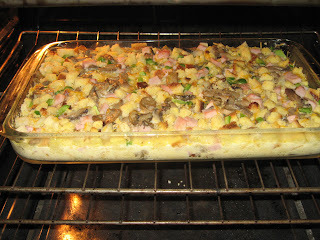 recipe that was a big hit at my house. SEPTEMBER - Blight....Blah! - It appears we have blight on our tomatoes! The Fragrance of Autumn - As I sit here enjoying the various aromas that filter through my home, I realize that most of them are signs of the end of summer and the approach of my favorite season. AUGUST - Additive Free Deodorant Recipe - To avoid exposure to aluminum which has been shown to relate to Alzheimer's, a problem that haunts me, I'm trying to come up with a recipe for deodorant that actually works but doesn't stain my clothes. Upcycling An Old Sock - My daughter had a favorite pair of socks that had stood the test of time. But on wooden floors, they're bound to give out eventually. JULY - Falling Behind - Seems like it's been forever since I've been online. We're having some computer problems that have kept me from writing here lately. Apple Cider Vinegar - Apple cider vinegar is an effective folk remedy for a lot of illnesses. JUNE - A New Start - Today is the kick-off of a project that I've been toying with for about 6 months. Tick Removal - Ticks are a problem here in central PA and many bites result in positive test results for Lyme disease. A while back, I posted a big THANK YOU! to everyone who has inspired me to learn more over the past several years. I've updated that post and added a few links so you could meet some of the awesome folks who have taught me so many things. 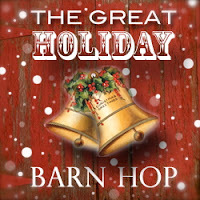 I hope you'll take a minute to read the post and check out the sites I've added. And may you have a Blessed, Happy, Healthy New Year! Goodness knows there are infinite ways that I can improve myself and my lifestyle but I'm usually overwhelmed by trying too much change at once which ends in nearly no change at all. So this year I'm trying to start small and make cumulative changes that will become second nature to me. I'll have more details on this plan later but there are several areas that I plan to attack...spending more time with God, focus on ways I can improve our homeschooling, becoming more organized, furthering my study of herbal remedies and alternative medicine through various means, replacing all chemicals in our home with natural alternatives, adding more whole foods to our diet, improving my blog and posting more regularly, spending more time writing, being more green, self sufficient and sustainable, and intentional physical exercise regularly. There are so many ways to do those things and so many more that I could add. I need to take my time in formulating a plan that I can follow specifically so I can actually pinpoint my progress. The way I plan to tackle the year is by setting smaller weekly or monthly goals that will ultimately add up to a year of progressive changes in all these areas. Slow and steady will hopefully win the day. Here's praying that all I do will be pleasing to God and strengthened by Him. As part of my goal to improve my blog, I've added a page where I'll post all my thoughts, stategies and struggles as I attempt to reach the goals I've mentioned here. 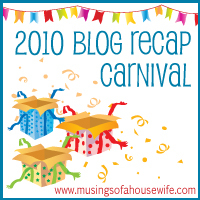 Just click on the 2011 Resolutions tab at the top of the blog. Watch for more tabs to appear over the next few weeks. 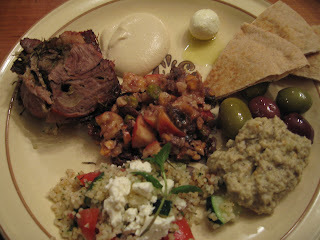 I've linked my resolutions to NOURISHING RESOLUTIONS 2011 CARNIVAL . My husband loves coffee. The stronger, the better. While we were out doing a little Christmas shopping, he discovered chocolate covered coffee beans at a local gourmet shop and considered buying some until we looked at the price. So I decided to try my hand at making some as a Christmas gift for him. I guess I need to learn to manage my time a little better! No wonder they are so expensive! 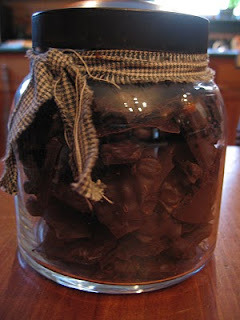 I melted my dark chocolate in a double boiler and added the coffee beans. So far so good. 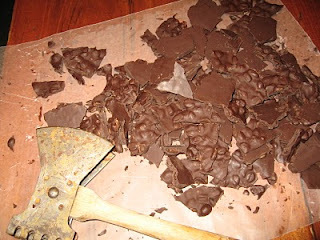 But then, how do I get individual beans out of the chocolate onto waxed paper? I tried a spoon...no good. A fork? A little better but very slow. That one cup of coffee beans in the chocolate looked like a bushel when faced with lifting each one out of the pot individaully. So I made a decision...coffee bean bark! Hey, it's festive, right? It may not be as gourmet in appearance as the ones in the store but they taste even better because of the love! Yeah, I'll just keep telling myself that as I watch him enjoying the bark. I inherited the wicked looking meat tenderizer from my grandpa. It worked well to break the chilled bark into small pieces without leaving fingerprints. This treat can be consumed in moderate amounts without guilt because of all the wonderful benefits to be recieved from both coffee and chocolate. The coffee beans we use are fair trade organic beans that we purchase from a local whole foods distributor. Coffee is a well known diuretic as anyone who travels with me can attest. The buzz or lift that folks feel from their morning coffee comes from the caffeine which stimulates the nervous system, elevates blood pressure and stresses the adrenal glands. Coffee can also deplete the body of calcium and B complex vitamins by decreasing the absorption of minerals that help the body assimilate these vitamins. Thngs to be considered in light of your state of health. But on the flip side, coffee has some wonderful benefits to offer as well. Coffee offers nearly 1300mg of antioxidants as compared to the next highest, tea, which offers 294mg! The National Cancer Institute found that coffee drinkers had half the liver cancer risk of those who don't drink it at all. The Harvard School of Public Health found that men who drank 6-8oz. cups of coffee daily cut their chances of diabetes in half and women by 30%. And now, Chocolate! What woman doesn't know the value of this Mayan treat? Real, unadulterated, natural dark chocolate is higher in antioxidants than red wine and green tea! On the antioxidant scale, chocolate boasts over 13,000 ORAC units. It's good for the heart because the flavonols that prevent clogged arteries also prevent blood clotting as well as a dose of aspirin. The reason we women find solace in our chocolate is not all in our minds; chocolate contains tryptophan, an amino acid that causes the body to release our "feel good" endorphins. Chocolate is an anti inflammatory and an analgesic too which explains why it seems to help relieve monthly symptoms of bloating and cramping. Something women seem to know instinctively. All these benefits together make these comfort foods and energy boosters treats we can moderately indulge in without feeling too guilty for the pleasure they bring us. I've posted this recipe on the REAL FOOD WEDNESDAY blog carnival. 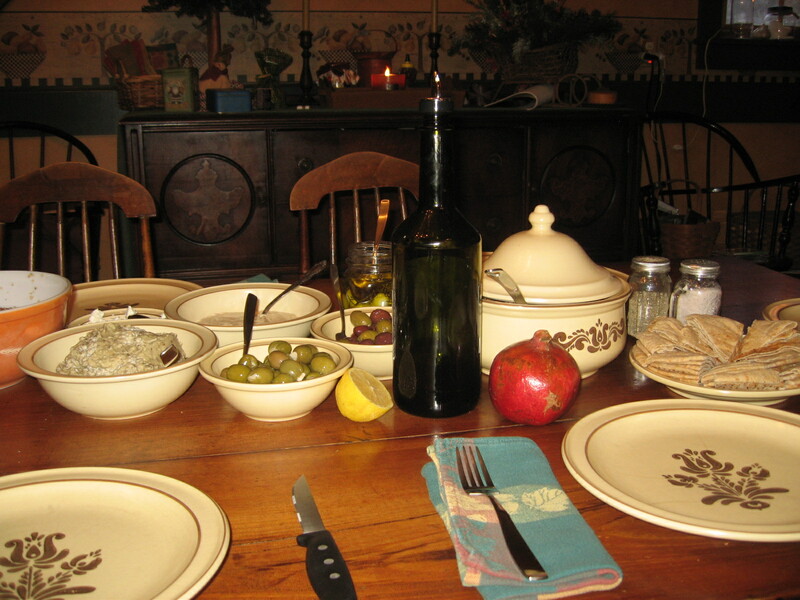 Check out all the wonderful recipes and information available there. Leg of lamb studded with whole garlic cloves, rolled in rosemary and wrapped in bacon before roasting on a rotisserie. 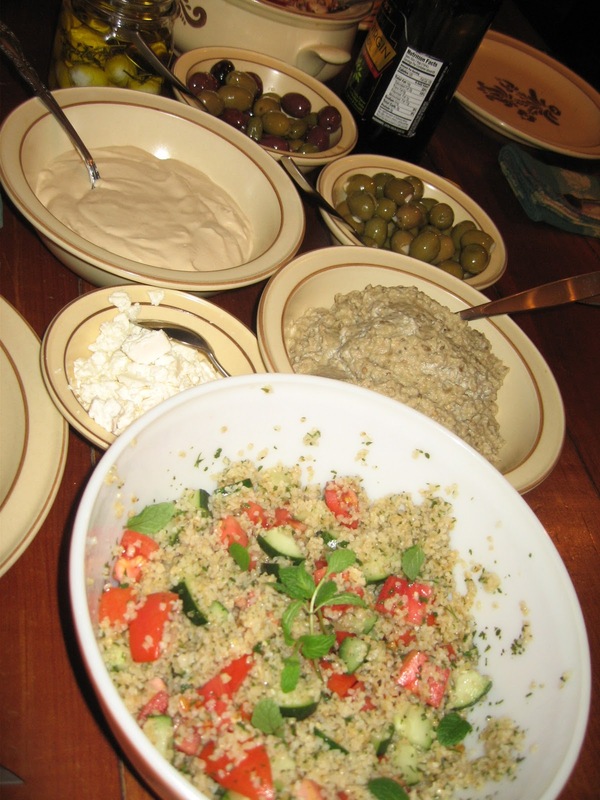 Tabbouleh - a Middle Eastern style salad made with soaked Bulgar wheat, lettuce, tomatoes, cucumbers, feta cheese, olive oil and lemon juice. Topped with fresh mint leaves and feta cheese. 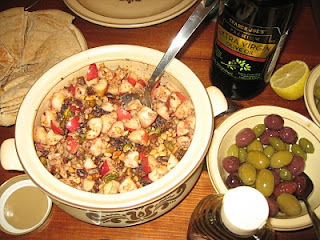 Haroset - a fresh apple, raisin, date and nut salad marinated in grape juice or red wine w/ honey. Hummus with pitas - turned out very well. It was nice and creamy with lots of garlic! Yum! Baba Ghanooge - eggplant dip - the girls did an excellent job making this. Can you add too much garlic? No!! 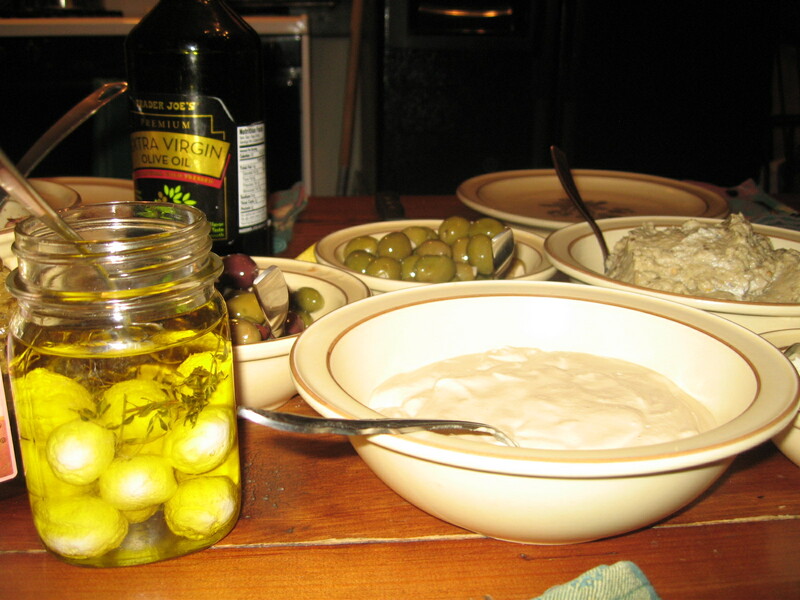 Pickled yogurt cheese balls - first I made yogurt from raw milk. Then I turned that into yogurt cheese. After draining the whey from the yogurt and adding salt to preserve them, I dropped the cheese by tsp onto a rack topped with a towel. The balls dried for 2 days on the counter. They were placed in a jar and covered with EVOO. I added a few sprigs of dried lemon thyme. They were really good - a creamy, tart flavor with a hint of thyme. 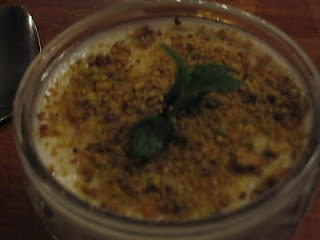 Milk pudding - a rice pudding flavored with orange blossom water and rose water and topped with ground pistachios. This was surprisingly light and refreshing. The flavors melded together to make a delightful end to our meal. Everything was so delicious that we're trying to figure out how to top it or add to it for next year! Good Morning! It's 5:30 AM on Christmas Morning and I've just put the casserole in the oven. It takes about 1-1/2 hours to bake but the results are worth the wait...especially since I'm the only one waiting while the others are still asleep. Mix above and pour into a 9 x 12 greased pan. That's what the recipe says but my husband, who's in charge of the casserole assembly, is usually pretty generous with the ingredients so he uses a larger pan. He like sto use glass. Pour over the bread mixure. Melt 1/4 cup butter and piur over the top. Cover and let stand in the frig over night. Bake @ 325 for 1-1/2 hours. IMPORTANT NOTE- If you use a glass pan be sure to put it directly from the frig. 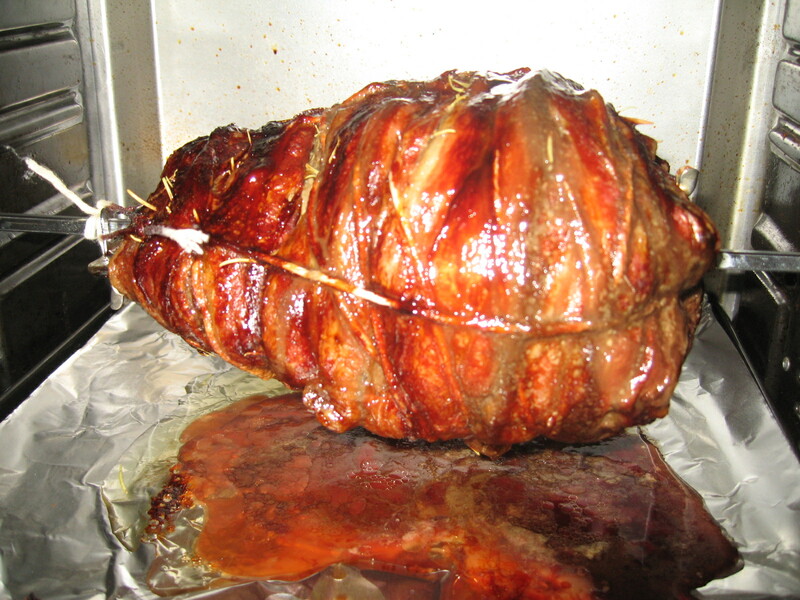 into a cold oven and then begin to heat the oven to avoid a temperature shock which could cause the glass to crack. Have a Very Merry Christ filled Christmas! We like waffles and I'm ashamed to say that we've been eating a popular freezer brand occasionally. It seems a shame to use our homemade maple syrup on commercially made waffles. Recently, a fellow theater mom told me that I just have to "ask Santa" for a Belgian waffle maker for Christmas because they are so much better. I tossed the idea around and looked at a few different styles in the store and sort of put the idea on the back burner. I'd never tasted homemade waffles but I knew that they could be a lot more healthy... I was still dragging my feet. Indecisiveness is one of my many shortcomings. Then we stayed with a friend who, completely unaware of my waffle conundrum, served homemade waffles and I was sold! We shopped around until we found one that makes 4 square waffles, just right for packing in my husbands lunch box. I'd like to share a recipe from the book that came with it. As usual, we're substituting as many organic, non-GMO, unrefined ingredients as possible. Add milk, oil, eggs and hot sauce; Mix well. Heat waffle maker and bake waffles. Serve warm with your favorite chili, salsa or eggs and bacon for brunch or supper! 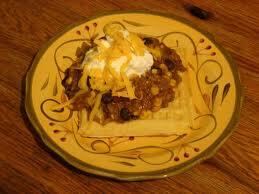 We topped them with chili, a dollop of sour cream! As a side note...with my waffle maker baking 4 square waffles that are a little smaller than traditional Belgian style, I can make about 24 waffles with this recipe so you might want to cut it in half or plan to freeze the extras. Now, let's see...I should make a new batch of homemade biscuit mix...I have wild Maine blackberries in the freezer...some gourmet syrups I've been saving...there's cream to whip...more homemade maple syrup in the cellar...some salsa in the cupboard...the possibilities are nearly endless! I'll be dreaming of waffles instead of sugarplums this year! What a great early Christmas present...in true Alvin style...From me; To me! God has a way of making me reevaluate my plans. I think He really has a sense of humor and uses it to keep me on track when I wander too far from where He wants me to be. Like a gentle nudge with a smile on His face. Due to some computer issues as well as some personal things, I haven't been faithful to posting here. My daughter is home from college for a visit and I'm sure it's going to pass much too quickly so I intend to enjoy every minute. Right now I need to focus on the true meaning of Christmas and a little ministry that's sort of answered a prayer in a way that we hadn't dreamed. Isn't that just like God? I have some interesting things planned for the new year and, God willing, I'll be more consistent in posting about some of the natural, healthy, green, fun things we've been making at our house. Meanwhile, when I do have a minute to spare, my seed catalogs arrived this week and there's nothing more relaxing than perusing the pages with a cup of chai and my slippers; making wish lists for the garden that is now covered with snow. I do have one more recipe to post before I break; look for it later today. So, if I don't have a chance to write again this week, I'm wishing you all a very Merry, Christ filled Christmas and a Happy, healthy New Year! After taking a nasty fall on the ice and jamming his spine, my husband has been off work for the past week. So, of course, ice and then heat...no lifting, no stretching, but keep moving to stop the muscles from stiffening. Yeah, you all know what it's like having a sick man in the house! Anyway, while he was recouperating, he got a head cold with a sinus infection. We did the typical herbal treatment and plenty of tea, etc. But when the sinuses became an issue, I told him to try something that had worked for me a few weeks ago. Snuffing a few drops of colloidal silver into each sinus. Not being a true believer in my herbal remedies, he was reluctant to try it. He did and reported that he felt no relief and thought that my cure from the week before was simply psychosymatic. I just smiled and said that perhaps his lack of cure was the same since he was sure it wasn't going to work. Later, I suggested he try it again before bed. He did and in the morning confessed that he was feeling much better! I heard him telling his mom on the phone in a very quiet voice that he thought it must have been the colloidal silver! Victory!